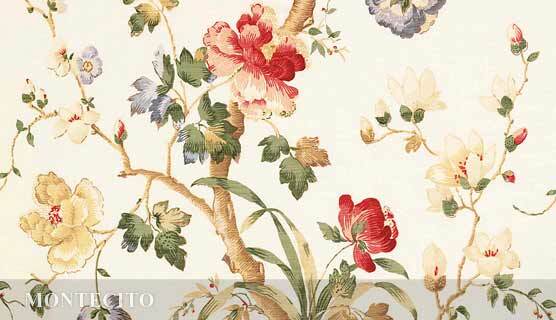 Dress the window with MONTECITO, a luscious cascade of oyster silk. This English design dates from around 1840 and our original document came from a grand house in Devon where it was used as bed hangings for a four-poster bed. It makes wonderful walling fabric and also comes with an aqua background on oyster linen (see Bennison newsletter for February). 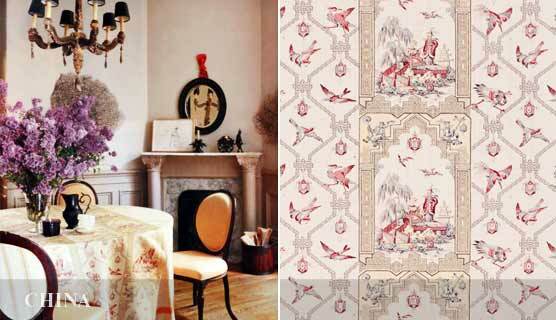 CHINA seen here used as a table runner in Elle Decor, January/February 2010. These Chinoiserie panels depict musicians, cranes and a weeping willow framed by bamboo latticework and surrounded by cranes in a hexagonal trellis pattern. Seen above in the original colourway of blue, red and cream on oyster linen. 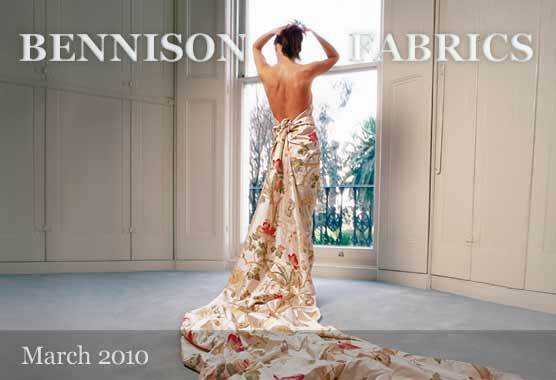 Also available in pink, green and cream on oyster which can be seen on our website in the Bennison Collection. There is also a companion print, CHINA BIRDS (see below) which comes in the same two colourways. 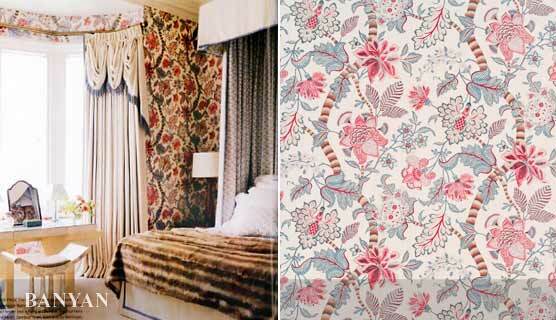 See more of both these fabrics on our Collection page. BANYAN shown above on oyster linen has been used as walling in this stylish bedroom decorated by Guy Goodfellow. This photograph appeared in House and Garden, March 2010. BANYAN also comes in a green colourway and can be seen on our New Designs page on the website. The name Banyan denotes a morning gown worn by men at home in the eighteenth century and these loose informal dressing gowns were often made of chintz, blockprinted in India and imported by the East India Company. All time favourite, ROSES, seen here to great effect in House and Garden, March 2010 covering a console table trimmed with studded nails. One of twenty-five special colourways of Roses, this Schiaparelli Shocking Pink version on oyster linen brings this mid nineteenth century English design bang up to date. There are more pictures on our Lifestyle Images page. 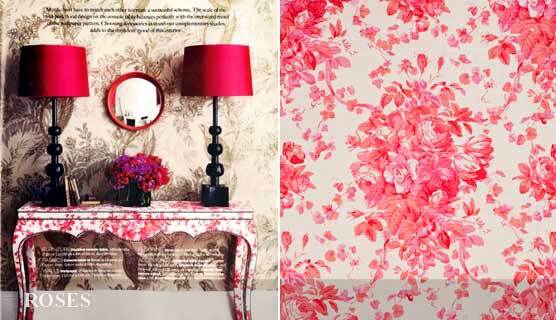 Finely drawn roses, tulips and carnations in faded colours of madder and indigo. This print was taken from an eighteenth century French fichu or lightweight cotton or muslin scarf and is printed on our fine oyster linen.